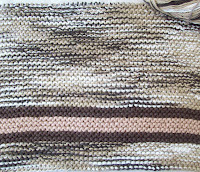 its place in the cycle—well for 24 hours..
After yesterdays post, I started this—another bathmat—and will relocated some stash to the linen closet! Its 13 inches now--(by 28) and next up is the stripe (7 rows) and the edge—together 5 inches-- and then binding off and weaving in. It will be finished before dinner. The final size will be close to 18 X 28 inches (circa 48cm by 60cm) a nice size for my postage stamp size bathroom. I am working with 2 strands of cotton held together (I think this is Bernat's HandCrafters cotton) and a size 11 needle and the work is going fast. 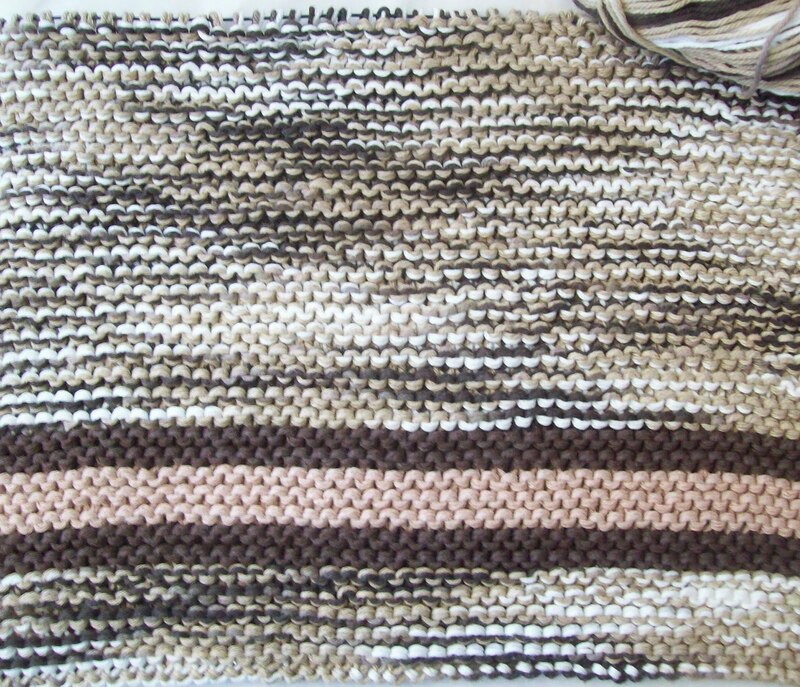 I've made bathmats before --and the first time, I was sure I'd never knit another--then I used it. Wow! Knit garter stitch bathmats are so cushy underfoot—they are luxurious—and so cheap to make! This is my 3rd (the first suffered a tragic accident, and is no more) for myself, and I've knit 2 for my daughter—and have some more cotton and will make another for myself, and likely make one for my DIL, too! But not now! I dislike working with big needles, and cotton is not the kindest fiber to work with for any length of time. I am lucky—my bathroom is white (painted walls) and white tile, and light grey tiles on the floor. The color is created by the towels—and I have lots of different color towels Lots of white ones, and lots of blue, and a good chunk of taupe/brown ones (the oldest) and a hand full of other colors—some gifts, some left over from a guest bath (in previous homes). So I can use up odd and ends, and almost any color cotton for a bath mat and the colors will work.